Since 2003, Piano Restorations has become the largest piano restoration and piano sales company in the UK. With a combined experience of 160 years, we pride ourselves on trust, personal service and 100% reliability, for both private and trade customers worldwide. Our craftsmen were trained to the highest standards at the Bluthners Factory west London. Director and master craftsman Paul Leverett was the last to complete the full Bluthner Piano Restoration Apprenticeship in 1992. 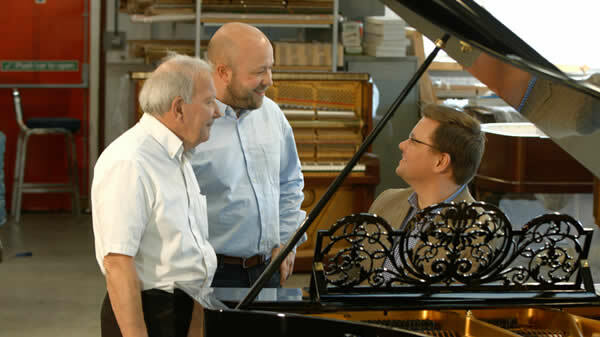 Paul’s father Colin Leverett started at Bluthners in 1955, 61 years later Colin is the wealth of experience at the factory and is regarded as the ultimate piano craftsman in the piano world. Colin and his brother Derrick Leverett were the pioneers of soundboard replacement. At Piano Restorations we specialise in Bluthner, Bossendorf, Bechstien and Steinways, but we also restore pianos from other piano companies. You may already own a piano, whether it be a fine grand or upright piano, it may have been in your family for generations with beautiful case work, turned legs, rare veneers, solid wood case parts, period features and historical charm, which are not found on today’s instruments. However, the tone that you once knew has long since disappeared, the piano isn’t playing very well, and perhaps your piano tuner has even condemned it saying it’s not worth repairing. Here at Piano Restorations we can take your old piano and return it to its former glory. Your piano will be indistinguishable from the day it was originally made and the tone will be even better than you remember. If your budget will allow you to buy a new Asian grand piano, your budget will allow you to have your current piano restored to new condition; fully hand built in the traditional manner, by master craftsmen, right here at our 5000 sq. ft. workshop situated in the Buckinghamshire countryside. Whether you are a professional musician, enthusiast, venue, recording studio or trade customer, we will be able to cater for your needs.